Breakfast is my favorite meal of the day. When I wake up I am starving and in the kitchen within five minutes busily whipping up an egg and spinach omelette and if anyone gets in my way they will likely get whacked over the head with my Paula Dean non stick skillet. Although it may be my favorite meal of the day, it is not necessarily the most important. You see, if you are gym junkie or fitness enthusiast, or even just like to lift a few weights a couple of times a week, your post workout meal can determine whether all that work you have just done will equate into muscle growth or be in vain. And if you think consuming large amounts of protein is the answer, then you will be surprised. Today we are going to take a look at how and why post workout nutrition should be your most important meal of the day, and show you a ratio that will optimize your muscle growth that can apply no matter where or what you eat after you workout. So why is what you eat or drink after you workout so important? Well when you are in the gym, lifting weights or performing resistance training, you are breaking down muscle fibers and depleting your muscle's glycogen stores to use as energy. When you step off the weights floor your body is in what's known as a catabolic state, which means that because of all the stress you have just put on it, you have hormones circulating that are counterproductive to muscle growth. You need to switch your body into an anabolic state, where you have replaced muscle glycogen stores and given your body the right amount of calories and nutrients to help your muscles repair. So what nutrients can help you rebuild muscle and replenish glycogen stores? Protein, fats or carbohydrates? Well most people believe that consuming a high protein meal or shake is the answer, but it is not. You see, while protein is important in your post workout meal or shake to provide your body with amino acids to help rebuild muscle tissue, carbohydrates are more important as they not only help rebuild tissue, but also replenish glycogen stores. While healthy fats such as EFAs and Monounsaturated fats are important to any healthy diet and muscle building eating plan, and should make up around 20 - 30% of your diet, it should not form much, if any, part of your post workout meal. Why? Because fat is absorbed slowly by the body, and will slow the rate of which any meal is digested and after you workout you need to get nutrients absorbed as quickly as possible to get your body into that anabolic state. So it is best you avoid overloading your protein shake with too many scoops of peanut butter. Now we know that both protein and carbohydrates are important, how much of each is best? Well whether you are eating a meal post workout, or throwing back a shake, you should follow the ratio of 2:1 carbohydrates to protein. If you are currently having a shake with a low carb protein powder, and not including any other carbs in your shake, then you simply are not providing your muscle with enough energy to replenish glycogen stores and you will be missing out on optimum muscle growth potential. 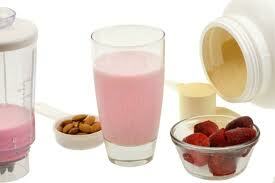 If you have a meal or shake with 20 - 30 grams of protein, you should also be having 40 - 60 grams of carbohydrates. This should make your meal around 400 calories which is pretty much what you need to be aiming for. Most people tend to choose a post workout shake as their meal after they workout, and this is probably the one time of the day where this is optimal. Whole foods should be consumed throughout the day to provide your body with slow digesting energy and protein, however because protein shakes in the form of whey protein are absorbed so quickly, they are the best option after you workout. If you do some searching on the internet for the best carbohydrates post workout, you will find a ton of articles talking about fructose vs glucose, some say newer forms of carbs on the market are better than others, but truth be told, you really don't need to worry that much about it. Whether it's a banana, some oatmeal, fruit or honey, they will all provide your muscles with when they need to replenish glycogen stores, so chose whatever works for you and what you prefer. Just ensure you are having 40 - 60 grams and you will be fine. Do a little more searching on bodybuilding and nutrition sites, and you will also find an endless supply of articles discussing when the best time is for consuming your shake. Some say that if you don't down it as soon as you step one foot out of the gym door you will turn in a pumpkin, your muscles will deflate, and you will forever live the life of a skinny guy. The truth is, it is not that severe. 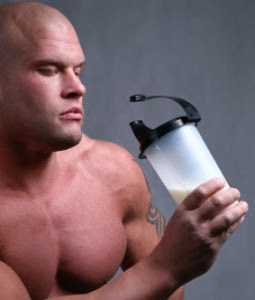 However the sooner you do consume a shake, the better, and there does appear to be a window of opportunity up to 45 minutes after you workout where nutrients are more readily used by your muscles to repair and grow, rather than be used for other bodily functions or stored as fat. So even if you are on a fat loss diet, or low carb diet, your should still consume calories and carbs post workout, as this will promote muscle growth which in turn helps to burn fat. So when choosing a post workout meal, opt for a shake with around 20 - 30 grams of protein and 40 - 60 grams of carbohydrates. Consume as soon as you can after working out, no later than 45 minutes after you finish any resistance or weight training. Treat it as your most important meal of the day, even if you are on a fat loss diet, and you will be providing your muscles with what they need to ensure they remain in anabolic state of growth. Hi Adam, Just started reading your blog last week and I'm really enjoying it. Trying to get through all the older articles as well. A lot of good information here. Some I already knew (but nice to confirm) and some that I didn't. Keep up the great work. Hey Kevin, the problem with the 2:1 ratio of carbs to protein in protein bars is that the carbs come from bad sources such as high fructose corn syrup or other chemically altered carbs. Even after a workout, a protein shake with good carbs such as a banana or oatmeal will be much more beneficial to muscle growth than a protein bar with a tone of artificial ingredients. Te other problem, is that most people are eating protein bars throughout the day, not just after a workout. Any suggestions for whole food alternatives to shakes? I am usually home from the gym at 10:30 am, and a shake makes lunch a late in the afternoon event. Any suggestions on a "light repast" alternative. I have been having a small amount of jarred herring (I read it is an excellent source of many good things,and because of their small size a low mercury fish) and a slice of multigrain toast. Can you suggest additions or alternatives. Just discovered your blog and I think it is great. Actually it doesn't matter whether it is high fructose corn syrup, agave syrup, brown rice syrup, it all has the same result, a sharp increase in the body's insulin, which is exactly the kind of reaction your body needs post work out. Take oatmeal off the list buddy, oatmeal is a slow complex carb (unless it is instant quaker oatmeal which is almost all sugar and little oat). But don't eat steel cut oatmeal after a work out, too slow, you want the fast acting carbs, fruit, honey etc. True high fructose corn syrup is not ideal, but neither are most of its trendy GMO replacements, like brown rice syrup. The problem with protein bars are usually the FAT, if you look at the fat content, they can be up to 30% of the body's daily value. As Healthyboy mentioned, you don't want any fat post work out. Best solution is 2-3 bananas or fruit and 30-40g of protein ISOLATE, no concentrated proteins. i am new to fitness thing...wasnt seeing much muscle gain as i would try to avoid carbs and just consume whey. i was overlooking this crucial post workout mix. According to me the diet that one takes should be according to the workout he do in the gym or at home. Take only those food which are useful for health after a certain kind of exercise. Adam you have posted about this nicely. Great job.